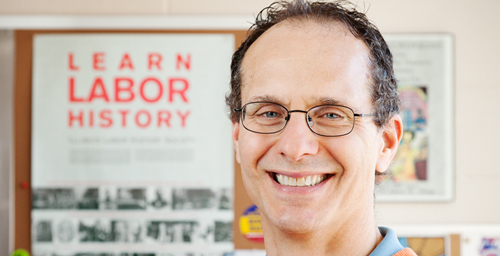 The claim that Chicago public school teachers aren’t working enough hours during the school day are unwarranted at best and intellectually dishonest at worst, according to research from University of Illinois labor expert Robert Bruno. CHAMPAIGN, Ill. — The claim that Chicago public school teachers aren’t working enough hours during the school day is unwarranted at best and intellectually dishonest at worst, according to research from a University of Illinois labor expert. The contentious debate between Mayor Rahm Emanuel and Chicago Teachers Union President Karen Lewis over the length of the school day has focused on Chicago public schools having the shortest official day of any major city – five hours and 45 minutes for elementary school students, and six hours and 45 minutes for high school students. But Robert Bruno, a professor of labor and employment relations at Illinois, says when you account for time outside of the contractually obligated instruction, a teacher’s day is almost twice as long. Bruno, along with Steven Ashby, a professor of labor and employment relations at Illinois, and Frank Manzo IV, a research assistant and graduate student at the University of Chicago, are co-authors of a paper that surveyed 983 Chicago Public School teachers. The study profiles a teacher’s standard school-day workload and the time they devote to the job. Teachers work 58 hours per week on average during the school year. Teachers work for 10 hours and 48 minutes on average during a standard school day, and spend almost an additional two hours working at home in the evening. Teachers work another three hours and 45 minutes on school-related work over the weekend. Teachers also spend an average of 12 days during summer break doing at least one school-related activity, and an additional 30 hours of professional development training while the school year is not in session, according to the research. The study also analyzes how teachers’ in-class hours are allocated. Other non-teaching duties that could be performed by a teacher’s aide – hall duty, bus duty, cafeteria and detention – also account for a significant portion of a teacher’s non-instructional time. According to the research, less than half the time in a day’s work is actually given to instruction. Teachers spend just over three hours each day performing non-teaching related activities, including behavioral management; speaking to students about a personal or family-related problem; communicating with parents; sorting data; setting up or taking down classrooms; and in meetings with administrators and planning with colleagues. Teachers should be the primary voice in determining how school time is used. time-consuming duties while increasing the time spent on actual instruction. Teachers should be given an appropriate increase in pay for any expansion of the official school day. The results of the study suggest that Emanuel’s idea of adding another 90 minutes to the school day would not produce positive educational outcomes. In order for that to work, teachers would need more resources, Bruno says. According to Bruno, the study also draws from a field of research that looks at time-intensification in the labor process – how workers are forced to multi-task, what happens when they’re forced to rush to do work, and how they perform after more and more demands are placed upon them. The burnout rate of public school teachers in Chicago is higher than usual, Bruno notes. Editor's notes: To contact Robert Bruno, call 630-487-0013; email bbruno@illinois.edu. The paper, “Beyond the Classroom: An Analysis of a Chicago Public School Teacher’s Actual Workday,” is available online.